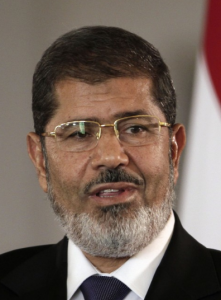 December 21, 2013 CAIRO (AP) — Egyptian prosecutors on Saturday referred ousted President Mohammed Morsi to a third trial, on charges of organizing prison breaks during the 2011 uprising, spreading chaos in the country and abducting policemen in collaboration with foreign militants. The new charges against Morsi and 129 others widen the legal crackdown on the ousted Islamist president and his group, the Muslim Brotherhood, leveling sweeping accusations, most of which carry the death penalty. Egypt’s new, military-backed authorities have sought to portray the Brotherhood as largely responsible for violence and militant attacks that engulfed the country following the 2011 ouster of Morsi’s predecessor, longtime autocrat Hosni Mubarak. The violence has surged in the aftermath of a popularly-backed military coup that deposed Morsi in July. The latest case against Morsi, Egypt’s first freely elected president, is rooted in events during the 2011 uprising. Days after major protests erupted against Mubarak, the government arrested dozens of Brotherhood leaders, including Morsi. Then, amid the turmoil and collapsing security, more than 20,000 inmates escaped in a series of jailbreaks, including Morsi and other Brotherhood members. Authorities said the jailbreaks were part of an organized effort to destabilize the country. Investigative Judge Hassan Samir on Saturday said other Brotherhood suspects in the case include the group’s leader Mohammed Badie, his deputy Mahmoud Ezzat, who is still at large, former Parliament Speaker Saad el-Katatni and others. Also charged are members of the Palestinian militant group Hamas and the Lebanese Hezbollah group. Members from those two groups were among those who broke out of Egyptian jails. A prominent pro-Brotherhood cleric Youssef el-Qaradawi, an Egyptian based in Qatar, is also on the list, said a prosecution official, speaking on condition of anonymity because he was not authorized to speak to reporters. Last September, the GMBDW reported that Egypt’s chief prosecutor had issued an arrest warrant for Qaradawi who was accused of inciting the killing of Egyptian security forces and meddling in the country’s affairs. The GMBDW reported last week that Qaradawi had denied any relationship to the Egyptian Muslim Brotherhood. The GMDW also reported this week that the US has designated an associate of Youssef Qaradawi as an Al Qaeda financier.